Younger Dryas space impact theory: missing the diamonds | Watts Up With That? DEEP IMPACT? : This 4 centimeter band of dark sediment uncovered at Murray Spring, Ariz., may indicate a cosmic impact or explosion that kicked off a period of global cooling and a mass extinction in North America. problem is, a researcher can’t find the nanodiamonds. About 12,900 years ago, a sudden cold snap interrupted the gradual warming that had followed the last Ice Age. The cold lasted for the 1,300-year interval known as the Younger Dryas (YD) before the climate began to warm again. In North America, large animals known as megafauna, such as mammoths, mastodons, saber-tooth tigers and giant short-faced bears, became extinct. The Paleo-Indian culture known as the Clovis culture for distinctively shaped fluted stone spear points abruptly vanished, eventually replaced by more localized regional cultures. One theory is that either a comet airburst or a meteor impact somewhere in North America set off massive environmental changes that killed animals and disrupted human communities. In sedimentary deposits dating to the beginning of the YD, impact proponents have reported finding carbon spherules containing tiny nano-scale diamonds, which they thought to be created by shock metamorphism or chemical vapor deposition when the impactor struck. The nanodiamonds included lonsdaleite, an unusal form of diamond that has a hexagonal lattice rather than the usual cubic crystal lattice. Lonsdaleite is particularly interesting because it has been found inside meteorites and at known impact sites. In the August 30 issue of the Proceedings of the National Academy of Sciences, a team of scientists led by Tyrone Daulton, PhD, a research scientist in the physics department at Washington University in St. Louis, reported that they could find no diamonds in YD boundary layer material. Daulton and his colleagues, including Nicholas Pinter, PhD, professor of geology at Southern Illinois University In Carbondale and Andrew C. Scott, PhD, professor of applied paleobotany of Royal Holloway University of London, show that the material reported as diamond is instead forms of carbon related to commonplace graphite, the material used for pencils. “Of all the evidence reported for a YD impact event, the presence of hexagonal diamond in YD boundary sediments represented the strongest evidence suggesting shock processing,” Daulton, who is also a member of WUSTL’s Center for Materials Innovation, says. However, a close examination of carbon spherules from the YD boundary using transmission electron microscopy by the Daulton team found no nanodiamonds. Instead, graphene- and graphene/graphane-oxide aggregates were found in all the specimens examined (including carbon spherules dated from before the YD to the present). Importantly, the researchers demonstrated that previous YD studies misidentified graphene/graphane-oxides as hexagonal diamond and likely misidentified graphene as cubic diamond. August 30, 2010 in Climate News, Paleoclimatology. For some reason, I believe there will be numerous comments about that quote on this thread. Yeah… no one can find the impactor. Odd how people forget misplaced chunks of iron such as the Willamette Meteorite No impact crater was preserved at the discovery site; it is possible that the meteorite landed in what is now Canada and was transported to the Willamette Valley during the Missoula Floods in ice as a glacial erratic or the Cape York Meteorite (and friends) one of the largest iron meteorites in the world. Est age 10,000 years ago. Graphite, huh? Did they find any rubber eraser particles? That would account for the megafauna die off. It took decades to find the extraterrestrial remnants at Tunguska. Is there any known theory which can explain the negative correlation between the terms ‘climate’, ‘nano’, and ‘paleo’ and the scientific validity of a piece of research? That poses an interesting question: From whence doth the graphene arrive? If it was terrestrial, then it would —I would think— happen frequently. If it was extraterrestrial, then let’s hope it doesn’t pay any more visits any time soon! Funny that such would conveniently coincide with the arrival of Cro-Magnon. This makes more sense than early hunters but then my opinion is not unbiased. We have seen other papers on this topic in recent years. So far interesting but not definitive. Another paper I will need to read. So, what DID cause that 40 cm layer in the photo? What would happen if a meteor strike took place on a kilometer of ice? So what could cause a 40cm boundary layer containing graphene/graphane-oxides? A 40cm layer seems too large to result from local phenomena like forest fires. Volcanic eruption through carbon rich rocks? “We should always have a skeptical attitude to new theories and test them thoroughly,” Scott says, “and if the evidence goes against them they should be abandoned”. The Gulf Stream does not appear to be slowing down, say US scientists who have used satellites to monitor tell-tale changes in the height of the sea. Confirming work by other scientists using different methodologies, they found dramatic short-term variability but no longer-term trend. A slow-down – dramatised in the movie The Day After Tomorrow – is projected by some models of climate change. Changes to ocean currents in the Atlantic may cool European weather within a few decades, scientists say. Researchers from the UK’s National Oceanography Centre say currents derived from the Gulf Stream are weakening, bringing less heat north. Their conclusions, reported in the scientific journal Nature, are based on 50 years of Atlantic observations. They say that European political leaders need to plan for a future which may be cooler rather than warmer. The findings come from a British research project called Rapid, which aims to gather evidence relating to potentially fast climatic change in Europe. I hope we are not going to be having another one of these “Younger Dryas” anytime soon. Sounds like an eraser event to me. If it was a large meteorite, then there have been 12 of them in the last 100,000 years (and lots of smaller ones) except for the last 12,000 years when there hasn’t been any. Greenland ice core temperature history. Do I hear a real scientist somewhere nearby? 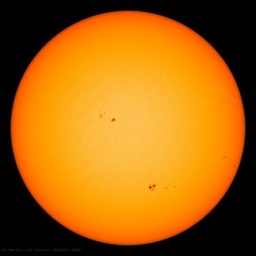 In this light the AGW hypothesis beast is so full of holes would someone please just kick it over! It seems to have died while still on all fours. There was an interesting program on the Discovery Channel last night about the extinction of the dinosaurs due to a meteorite impact 65 million years ago. Several points were made later in the presentation – that it’s not a question of if, but when this happens again. Even though there is a group of scientists watching for incoming meteors, when interviewed they freely admit that many objects could escape detection until it’s too late. Apophis is coming in 2029. Calculations indicate it will pass between Earth and its communications satellites. This is one of many concerns that have been all but abandoned during the era of global warming hysteria. I visit Murray Springs from time to time, when I go to see my mom in Sierra Vista. It’s not 40 cm. I think we lost a decimal point somewhere. Still have not look at the position of our planet to the sun NOT being at the equator, but moved to the northern hemisphere of the sun so we can see the suns north pole. Sorry, you will not like this but my belief is that an electric discharge or giant thunderbolt did this. Thus no diamonds. The clues are several. 1. Niagara falls formed at the same time. 2. There is no sedimentary deposits from the Grand Canyon. 3. The rivers and lakes in the Sahara disappeared. 4. The layers covering the USA. 5. The end of the Clovis age and 6. the start of the Younger Dryas. As with the Scablands, the Grand Canyon was formed very quickly but by electricity rather than water. The event is recorded in Human Mythology. There is also evidence of other massive earth changes at the same time as well. When you look at the alternative and all the evidence it certainly is more than possible. Grey Lensman, do you have a source for that? About 15 year ago the resident science expert for the industrial magazine “R &D” speculated that the reversal of the earth’s magnetic poles triggered a flash freeze event. It supposedly accounted for the fact that mammoth carcases have been found standing upright, with undigested vegetative matter in their stomachs. But I, among others, think the Younger Dryas was triggered by the sudden emptying of Lake Missoula and it’s St Lawrence Seaway cousin into the deep water formation areas. “Sorry, you will not like this but my belief is that an electric discharge or giant thunderbolt did this. Thus no diamonds. Not that I don’t like what you said so much as I do not understand the statements. Could you elaborate on how all these “clues” point to a massive “electric discharge” or a “giant thunderbolt? Naming landmarks and pointing out known extinctions of megafauna or the Clovis Age do not do anything in the way of connecting them to your “theory”. Unless this was a joke? But what caused Lake Missoula to empty. This is also tied to the draining and formation of the Great Salt lake. I think but have not checked that the last great Scabland flood occurred at that time. Note also that the Sahara went from tropical rain forest at that time as well. Plus the east Coast USA has very deep depository layer with Clovis remains under it. It is possible that the event was co-incident with a pole shift, the Pole shifting from SW Alaska to its present position. This moved the Ice instantly to Siberia freezing the last mammoths. Yes, its only a theory but it fits all the evidence. ….and the graphene comes from…. where? How does graphene and graphane oxide form from graphite or carbon. Why would there be graphene in the layer and what is the source? So, is there graphene above and below the layer in question?…. or is the graphene only in the 40cm layer? Is the layer caused by flooding, volcanism or neither of these two processes? What is the reason for there being a layer anyway and what time span was the layer built up in ? Seems they haven’t done much except rule out nano diamonds…. Which is good, but surely they could exhibit a bit more curiosity and actually answer a few questions….? Direct link to thunderbolts, no but the evidence clearly points to a similar event. The recent findings of carbon rather than diamonds indicates an electrical rather than an impact event. How else do you explain, or at least attempt to, the recorded events. Note also That Golbekli Tepe was built shortly after this event and that the destruction of Puma Punku can also be dated to the same time. Clearly this was a global event. Either way, a meteor or thunderbolt, the results in Human terms are the same but the evidence points to the thuderbolt. This can be tested in lab as well. Engineer………. I read somewhere that upright mammoth carcasses are due to the upper permafrost layer partially melting and refreezing…. This process pushes rocks out of the soil… So it does the same with frozen mammoths. As the body gets pushed upward it rotates the larger area to the top…. thus the legs are below and it looks like it was frozen standing up. The fact that a relatively undecomposed mammoth is buried in soil that is or was permanently frozen, would suggest that the animal in question was covered in liquid mud which then frozen in quick succession….. That is interesting in itself. It would suggest a major flooding event, volcanism and lehars, etc. The asteroid impacted the ice sheet……the “evidence” melted away thousands of years ago. I agree. I had this thick copper cable and I plugged it into a large current bush and touched the ground with the free end. Oh. Sorry, that was the dream I had after visiting these two places and exalting in the power of rushing water. Excellent point. We need 2 Solar Polar missions like STEREO. We could call them STEREO Above and STEREO Below. That’s easily explained by the mammoth falling thru ice covering the mud. Even an animal the size of a mammoth would quickly die of hyperthermia in near freezing mud/water. Hence the undigested stomach contents and upright position. John Holtquist. I dont think that there is any need for that type of comment. I suggest you tell me where the 3,000 cubic miles of sediments are from the water eroded Grand Canyon. The comments about volcanoes and lahars. are valid but where are they, especially ones with such a widespread impact. I vote for an ice sheet impact. Very interesting post (and some good comments (even the sarcastic ones) ). The Younger Dryas is indeed one of the most intriguing recent (on a geologic time scale) events: 3rd rock from the Sun had been coming out of a major ice-age for, what, about 1000 years; when in an geologic eye-blink (at most a few decades, or even as little as 10 years, from what I’ve read) it temporarily plunges back into pretty much a full-blown ice-age for 1300 years, before doing another about-face and entering another relatively rapid warming period (all without any help from CAGW). If modern society has, say, 100+ years to adapt to something, we can probably adapt reasonably well to substantial changes. But it’s not hard to imagine the magnitude of the world-wide disaster that would occur if anything close to the historical Younger-Dryas occurred now, and average temps dropped by 6-7 degrees C or so in just a decade or so. Something stopping the North Atlantic thermohaline circulation is certainly one of the prime suspects, but there are other plausible theories; nothing proved yet AFAIK. As someone who studies this subject (but not an expert), the typical signatures of a meteoric impact would not be there if the object impacted the Laurentide ice sheet. The graphite is interesting though. If you vote for an icesheet impact, the layers are rock not ice. So where was the sediment excavated from? There is a major sediment layer, there is no sediment out the Grand canyon outlet, this study shows no impact, so what are you left with? Other suggestions put the cart before the horse, they need a cause. It was a big event, so look for global events and they are there. Imagine the Kenyan plains are swamped by a muddy tsnami then frozen. In 13,000 years millions of wilderbeast bones are found piled up. At the edges of an area carcasses are found frozen with grass in their stomachs. How would researchers put that together. Similarly we find the same sort of thing in Alaska and Siberia, we find a sediment layer, we find cultures missing, we find changed climate. But we dont find Impacts or Man Made CO2 or volcanism. If you’re ever in Sierra Vista, the Murray Springs site is very nicely laid out for visitors. The trail is easy and the interpretive signs are informative. It’s easy to drive to, although there are no highway signs to attract vandals . My follow up comment on the black matt size seems to be getting deep-sixed. Could it be that your spam filter doesn’t like the link it contains? So the question remains… How did a layer of sediment containing Graphene come about? What hypothesis is posed to explain it? …. how extensive is this layer anyway? The exploding of supernova Vela for about 11000 yers ago may have a large impact on earth. But probably a even larger impact on our sun. Recently I found that there is possible existence of what I termed ‘North Atlantic precursor’, pointing to, or even actually causing, the area temperature changes. The effect of it may be very rapid as can be seen in case 1710-30, the fastest rise and fall in the CETs in the historic records. In 1908, there was a huge explosion (~0.5 megatonnes) in the atmosphere above Tunguska, western Siberia. This was a comet, or asteroid, exploding several miles above the Earth’s surface. Most incoming objects (~90%) from space are made of brittle stone (silicate minerals) as opposed to nickel/iron metal, which are more likely to survive because of their hardness and durability. A high altitude explosion, many times larger than Tunguska, might explain the trigger mechanism for the Younger Dryas. Also, as there was no impact with the Earth’s surface, the extreme pressures required to form nano-diamonds would not have occurred. Below is the math ( Source: http://www.psi.edu/projects/siberia/siberia.html) for a Tunguska type explosion for a 30 metre wide object incoming at 15km/sec. An incoming 500 metre wide stony object might have been sufficient to trigger a Younger Dryass event. First, we have to know the energy liberated by an A-bomb. The Hiroshima bomb expended the energy of roughly ten thousand tons of TNT, or 18 “kilotons” in military parlance. One kiloton (1 KT) is about 4.2 x 1012 joules (the joule is the unit of energy in the Standard International, or “SI,” set of scientific units). The Hiroshima bomb thus represented roughly 8 x 1013 joules of energy. Now all we have to do is calculate the energy of the meteoroid. In freshman physics courses, you learn that the kinetic energy of a moving object is 1/2mV2. The trick in using any equation like this is to be sure to use the correct units. In SI, the units are meters, kilograms, and seconds, so that mass m must be in kilograms and velocity V must be in meters/second. Thus, right away we can say that V in the equation will be V = 15 km/s or 1.5 x 104 m/s. m = (4/3) PI R3 (3000 kg/m3) = (4/3) PI (15 m)3 (3000) = 4.2 x 107 kg. E=1/2 (4.2 x 107 kg) (1.5 x 104 m/s)2 = 4.8 x 1015 joules. To be safe, let’s imagine that half the kinetic energy is lost to noise, slowing, and fragmentation of the meteoroid before it explodes. That still leaves about 2 x 1015 joules for the Tunguska explosion, compared to about 3 x 1013 joules for the Hiroshima A-bomb. Thus, our estimate is that the Tunguska had an explosive energy roughly on order of 60 A-bombs, or 500 KT of TNT. It was closer in effect to a very large H-bomb. Grey Lensman, your “theory” (read: hypothesis) doesn’t stand until you provide some evidence for it! I mean, what is the evidence that electricity formed the scablands? More importantly, what is the mechanism? Read, I did not say that electricity formed the Scablands. The method of their formation was sudden catastrophic flooding and they formed in days. This has only recently been accepted. I was pointing it out as part of a much larger picture. There are loads of reports and discussions on the subject, from which I have formed my own ideas and time scale. This I feel is not the place to discuss them but to use them as to illustrate how we can all rush to conclusions or simply follow the herd. The poster above illustrates nicely how well maths can be used and in great depth but it does not mean that the proposal is correct. The subject matter here is climate and the claim that despite so many inputs, CO2 is the only one that matters. This is a common failing and restricts our ability to truly perceive events and their causes. Such is the case here, none of the standard theories stand up. So time for a new one. It would seem to me that at the time of YD event the ice would have been melting for over 1000 years and would therefore have formed huge freshwater lakes sitting on top of the yet to met ice but held back by ice dams close to the coast. The sea would still be very cold and glaciers would be pushing out and calving as they do now. This calving would bring the ice dam closer and closer to the sea. The sheer weight of water or possible even a small meteor or earthquake would have breeched the dam and caused thousands of cubic miles of water to rush into the sea. This would have gauged the coastal plane and left a thick layer of sediment as well as killing everything in its wake. A subsequent disruption of the thermohaline circulation is also not impossible. I am aware of such a theory explaining some of the surface geology in North American and it has been mooted that such an ice dam in the Mediterranean may have been the origin of the biblical story of the Great Flood. It therefore seems that entirely natural causes might have been at play. Where have I heard that before? Mass magafaunal abduction by aliens is still on the table, though, right? Puma Punku is much later than that. The force of these phenomena was demonstrated last year when the Focault pendulum in Paris broke last year despite the absence of sunspots and a record weekly increase in arctic sea ice cover. We should be hearing more of how this drives unstoppable warming of the global core now that the Hannity Show has broken the tricky stickists icy IPCC monopoly by securing Alexander Cockburn to repersonate Lord Monckton’s party in the European parliament. Christopher, great prose. Have you considered that possibly nature discovered a flaw, a breakdown in recycling. tried to overcome it with the invention of grass and when that failed, invented humans. We are doing our job great returning vital co2 to the atmosphere stopping the planet from extinction. Just a thought. OK, GL, I’ll play. Who says, besides you, that the destruction of Puma Punku ‘can be dated to that same time’, that is, shortly after the Younger Dryas. It seems to me that the destruction, not the origin, is dated to only around a millenium ago. But I do thank you, GL, for the tip about Gobekli Tepe. What a zoo! I am trying to show how science in general has generated a “Peer-Reviewed” course of mistaken theories as the consensus of science. There is 2 routes that should have been considered. The current science believes in the theory of fussion and nuclear motion that is keeping planets rotating and generating magnetics. The actual “physical evidence” shows that the planets and suns are infused with rotating energy that is stored and is slowly being used. Compressing gases and mass stores energy. On a rotational base, it is very simular to compression of a spring at birth of a solar system and allowing this compressed energy to slowly decompress. The speed of rotation and materials is a very important factor to how compacted the energy is. Centrifugal force was deemed a pseudo-science as scientists could not figure out what it was and it’s purpose. Yet when lookin at the evidence, we weigh less at the equator and this evidence was NOT carried to the suns energy output. The sun holds the planets by magnetics. Yet we are not bound to the equator of the sun which would be the hotest point. So, in the planet drifting, an Ice Age is a predictable event. Grey Lensman, you write tantalisingly about big global geological anomalies pointing to catastrophe, that all lie in the same YD time frame – then you give no refs, no follow-ups! However, I found The Cycle of Cosmic Catastrophes which looks like source info for the sort of phenomena you mention. Interestingly, it has excellent ratings generally, is described as a bad cover for a scientific book that is also a good read, and it’s linked sales-wise with, inter alia, Andrew Montfort’s Hockey Stick Illusion. Well, that was enough for me to go for it. Have a look at the Turku archipelago in Finland (SW Finland) using Google maps. There are two formations that look strikingly like meteorite impact craters. The bigger one is “Mossala fjärd” north of Houtskär/Houtskari (diameter ca. 6 km). The other one is “Ängskärsfjärden” close to Åva on the eastern part of Aland (diameter ca. 5 km). Neither of these are presently accepted as meteorite impact craters because they look very atypical. Geologists have said that they are of volcanic origin with an age of approximately 1.5 billion years. The reason for this estimate is that they look like if roughly one kilometer of rock has weathered away. I have visited both places during the last three years and I simply don’t buy the old age estimate (I am a physicist but not a geologist so I may be mistaken). For example the south western part of Mossala fjärd has very broken edges with _clean_ essentially unwithered surfaces. One single ice age would have at least rounded the cliff edges. My view is that the craters look atypical because what we see is the remnant of bigger craters that was formed when one big (1 km diameter?) meteorite arrived from north east at a very flat angle and broke into several pieces with the biggest striking Mossala, and a slightly smaller one striking Åva. At the impact the “rock” was broken and enormous amounts of material down to a depth of 1 … 2 km was spread over the surroundings. This is possibly where the accepted interpretation may err. The “craters” are atypical because the rock that the impact should have spread in the surroundings with layers of broken tens of meters deep and distances up to some 50 … 100 km is missing. If on the other hand the impact was toward inland ice there would have been wast amounts of broken rock spread around but because the “rock” was ice nothing is visible today. Only the deepest parts of the craters would be visible today. There is a third interesting formation on the “Korpo” island ca. 20 km south of the Mossala formation. There is a roughly 1 km diameter impact like crater seen on 3D maps. I haven’t visited this formation yet so I can’t give more details. – Both areas show areas of broken rock at the edges. – A friend of mine found a piece of glazed sea bottom at his summer cottage ca. 15 km south of the Mossala crater. It smells like mud when polishing it in water. Fossiles are extremely rare in Finland because ice ages has cleaned the land several times. The piece looks very similar to glazed sea bottom found in “Siljan” in Sweden (diameter ca. 50 km) known to have been caused by a big impact. – I think I have found breccia at Mossala. – I think there is a very large number of “bombs” lying around everywhere. A bomb is molten rock that is thrown away from the impact site and cools very rapidly. Fast cooling doesn’t allow crystal structures to form. I cut one of these this summer and it looks partly molten with no clear chrystal borders (amorphous). – In my youth (ca. 1965) we found pumice at the island “Lövskär” ca. 10 km towards SW from the Mossala crater. We then assumed that some ship had brought it from abroad but it could as well have been locally produced through an impact. – I haven’t yet found clear impact cones. Impact cones would be a very strong sign of a meteorite impact. – I have found a number of big pieces of rock with sharp edges and clean unwithered surfaces lying on top of rocks polished by the ice having no marks of abrasion (big rocks were moved by the inland ice towards SSE. My interpretation is that some of these may be rocks that were moved to the top of the surrounding ice by the impact and then gently deposited into the present location when the ice melted. If there was a big impact at the end of the last Ice age (assume for simplicity ca. 12900 years ago) then some 100 km³ of water would have been thrown into the atmosphere. I then assume the ice thickness to be 1000…2000 m. The southern edge of the ice was then roughly at Jurmo/Utö some 40 km towards the south. Because the impacts correspond to tens of thousands of Hiroshima size bombs a significant part of the water would have gone into the stratosphere (where it stays for a long time) causing enormous impacts on the northern hemisphere weather. Most of the water would probably have come back down very fast causing heavy floods again over the whole northern hemisphere. It is well known that the fast warming at the end of the ice age stopped for almost 1000 years starting roughly 13000 years ago. If somebody knowing something about impacts/geology is interested in looking further google me and send an email to me. Meteor Crater Arizona – 50m chunk? Nawww. Did they find microdiamonds associated with this and the other indicators mentioned? I note mention by several commenters that Mamoths were found frozen standing with grass in their mouths. I have heard the theory that these beasts may have fallen into crevasses while walking over tongues of ice. It joins a lot of dots but you have to dig around it. Thats all i have done, as a Layman, I take all with a pinch of salt. Man Made global warming included. Especially when they changed the tune to “Climate Change”. The effects of the event that caused the mystery layer in the USA were global and are readily visible to all. How you interpret the data is another matter. Seeing if you can fathom a different answer is part of the fun. …formed by electricity rather than water….? So what is it? Scablands formed by water, but the grand canyon was carved out by electricity? Just need some clarification of what you are trying to say here. Moderator – if you happen to be looking for the errant italics tag, it’s at the end of the comment at 9:43 pm on Aug 30th. Something really happened around 10,000 years BC. Tradition and history tells that was the epoch of the mythical disapperance of Atlantis, due to a series of earthquakes, which left islands like the azores and bermuda. What else has it been discovered about this? Here, this is the best link I have on this subject. Woolly Mammoths: Evidence of Catastrophe? “I saw the article on the lack of evidence for a ‘large’ impact, but my theory concludes it was a storm of small meteors, and not large enough to create nanodiamonds. I think the North American firestorm was started in many places by many small impacts. Otherwise, why would any fire burn an entire continent and kill everything on it? Small rocks raining down have impacts, but only produce small craters and extreme heat. I sure wouldn’t rule out impact from crossing the Taurids core stream. And a lot less of it had been lost to the Sun and Jupiter back then. It’s called Yuma, the Imperial Valley and the Gulf of California. Remember sea levels were a lot lower and the Salton Sea area is below sea level. as with Scablands, Grand Canyon was formed very quickly. I>E> They both formed quickly. Scablans was formed by flood water but however, GC was formed by electriciity. Says the same thing, not what you are inferring. Remember, its a theory, that explains several strange events but not totally. Other things must have happened in conjunction or in tandem with, but thats another story. Try and have some fun thinking outside the box, something warmers could do with. Again, Night night and thanks for the chats. The YD is a cluster of cold events the similar to the LIA, also known as a Heinrich event. Their frequency is 4627yrs, such that 3 of these periods map from the Older Dryas to the LIA, so that 3*4627yrs after YD is another cold event cluster. The period between YD and OD is the same as the c.1150yr cycle we see mapping back through LIA, MWP, Dark Ages, Roman Warm Period, Greek Dark age etc. So on that basis, I would place the next cold cluster starting around 2450AD. Grey Lensman it is not a theory. Its a hypothesis! And I just want to make this clear, because your style of writing makes it about as clear as mud. You are claiming that the GC was carved out by electricity? Right? Because that is about the stupidest thing I have ever read. And I like to think outside the box, but I need to keep that box constrained by physical reality. Hey, come back here, GL. Archeologists claim that the oldest layer of Puma Punku dates to around 400 AD, leaving the whole complex around a 600 year life and all of it in the Christian Era. Younger Dryas ain’t even in it. You are claiming that the G[rand] C[anyon] was carved out by electricity? Right? Because that is about the stupidest thing I have ever read. And I like to think outside the box, but I need to keep that box constrained by physical reality. Electrical scarring on a grand scale is a viable alternative to the highly speculative and ad hoc explanations offered regarding all of the rocky bodies in the solar system, not just earth. If you haven’t had doubts about NASA’s hypotheses on the unexpected markings and/or hemispheric differences found on every moon, you may not have been paying attention. Paul LaViolette’s theory seems to fit once again….. does it deserve more attention? A storm of small rocks will leave many small craters, and thousands of intense fires. The craters would be unrecognizable in just a millenium. This is the only way the north american continent could have suffered such an intense firestorm, which eliminated all the clovis civilization, all the animals, and all the fauna. It also put enough suet and carbon and ash into the air to initiate a rapid cold ‘snap’. This part went global. Or, could the firestorm have ended the younger dryas? Prof. Jared Diamond states in his Pulitzer price winning book “Guns, Germs, and Steel: The Fates of Human Societies”, that the mass extinction of big animals in North America around some 12000 years ago happened right about the point of time when the first humans appeared at the scene and that he doesnt believe in climate factors but that the arriving archaic hunter hords killed all big animals within a relatively short amount of time. They were experienced hunters and those poor mammoths had never seen humans before. When I was reading the book I remember it sounded very sound to me. Yeah… no one can find the impactor. Only meteor impacts have impactors that we can find. Cometary impactors generally do not. Air bursts do not, either, generally. No one has ever found a Tunguska impactor. Are we to believe that nothing happened there? That is incorrect. The earliest Cro-Magnon man dates to approximately 35,000 BP. Zeke the Sneak you too think the grand canyon was carved out by electrical discharges? Really? What’s the evidence? Are some of you folks here just willing to believe anything at a whim? Firestone et al did test this out in a ballistics lab, as well as they could. There was essentially very little effect under the ice, while the ice was blasted to smithereens, as you would expect. It isn’t definitive, but supported their premise. Firestone et al really have floundered, looking for exactly what they think happened. With no impact site, that is tough. The “Carolina Bays” that exist up and down the Eastern Seaboard have an axis-alingment pattern that centers around Lake Michigan/Wisconsin, and ones in the Great Plains do, too. It appears something occurred in that area, but evidence is sending their brains here and there. It is giving others fodder to throw at them. There ARE other studies from quite a few other scientists that identify the material as nano-diamonds, so this study is either wrong or all the others are. The lines are being drawn in the sand. One side is lying low, trying to play “skeptic” (WHA??? Stealing our thunder?! !…lol), while the other side is trying to explain what all the evidence means. Firestone first thought it might be a super-nova nearby, with an energy wave and a later blast wave (still to come if correct). Some evidence still points at that. Some does not. The LAYERS are definitely at the Y-D boundary, so SOMETHING happened then. So far no one has mentioned the Carolina Bays phenomena. A series of tear drop shaped water filled holes mainly located 0n the eastern to mid-western north American continent, with a NE to SW orientation. (If I remember correctly, there have been some found in northern Europe). Their formation seems to have occurred at about the same time as YD. (2) isn’t the thickness of the sooty layer 4 cm not 40? Zeke the Sneak you too think the grand canyon was carved out by electrical discharges? Really? What’s the evidence? Are some of you folks here just willing to believe anything at a whim? The hypothesis that the planets and moons show evidence of powerful electrical scarring begins with some very basic premises regarding craters. It has both explanatory and predictive power has the advantage of being reproduced in a lab. There is no point in discussing the Grand Canyon until the foundation for electrical cratering, that most common of topological features, is laid. 3 photos of cratering on nearby bodies should suffice to show that the meteor impact explanation for these craters is freighted with difficulties. missing ejecta, smaller craters on the rims of larger craters, craters always round (except when they are hexagonal), central peaks, flat crater floors, craters found in close groups, to name a few. It is precisely the opposite of a whim to question NASA’s meteor impact hypothesis for the rocky bodies in our solar system. Geologists have a bit different reconstruction of past climate which I’m also drawn to. Welcome aboard Steve, its so very nice to hear from you again! The Carolina Bays have NO meteoric Material (only a little salt, in the mounds at the NW end – – incidentally, implying an Impact FROM THE SOUTHEAST) … but when I investigated the normal disclaimer – – which is that they occur near Barrow Alaska, also, so they must be GLACIAL … I found the people there cited the Carolina Bays as examples their “Bays” were likely meteoric – – as THEY KNEW IT COULD NOT BE GLACIAL BECAUSE GLACIAL ICE IS NEVER EVER EVER SALTY. I have numerous times claimed an OBVIOUS Solution exists: Louis Frank’s “Small Comets” or “Water Comments” are SECONDARY METEORS. – – But, you say: Mars Secondaries are ALWAYS ROCK. Moon Secondaries are ALWAYS ROCK. – – Yeah, & how many Lakes & Oceans do they have between them ? ? 75% of the Earth is salty Water, and ~6% is Glacial = Fresh. Most Big Earth Impacts spray WATER ! The seminal calculations on the Carolina Bays are in Otto Muck’s book – – take a DEEP breath – – The Secret of ATLANTIS. Yes, that’s right: and if every Scientist didn’t immediately get scared off – – he explains Noah’s Flood, too. And if THAT didn’t stop them, he actually makes sense, by first calculating the Size of the Blast – – in foot-pounds, no less, he uses MOMENTUM to get a “rebound” in terms of the Volcanic Activity – – and coming up with.an amount of rainfall – – 40 CUBITS (if you.remember your bible & your science, Science says the Sea NEVER ROSE to drown the Land in the last Billion years — BUT the Bible does not SAY that exactly – – we just ASSUME that – – as it says the TOPS of the Mountains were covered. Muck says: from ABOVE. 60 feet of RAIN & a weird Cloud reflectance effect. And yes, the predicted rain in the Volga River Basin sends a wave up the Araxes River which, Due to a Funnel effect — is a 1000 foot-plus wave. The valley turns at a Mountain so the Wave would run up the side of — what’s that Mountain’s name ? Oh, Yes, Ararat. I am NOT kidding. It’s a DeBunker’s NIGHTMARE. Muck says the “fountains of the deep were broken upwards” implies, at least 1 Eyewitness KNEW that a Volcanic Rebound was going on – – even if thousands of years later they could only imagine that the Plug was pulled on the Divine Bathtub. Actually he HAS to be right. FIRST, the Coast of France is PUMICE – – and the right QUANTITY. Just look at any Map. There are _NO_ river Deltas. It is Bizarre. Second, in the Ice Ages the Atlantic Currents went DUE EAST, to Spain. Now this does not bother anyone ELSE, but Muck, the Nuclear Physicist, could not believe that CORIOLIS could be just IGNORED. The Forces are TOO big – – the Atlantic MUST ROTATE. Period. – – Thus, the Azores must have been higher (after all, parts are islands today), blocking the current. Period. AND, the amount of ejecta neccessary to reduce the Azores height agrees with Conservation of Momentum for the size of Craters measured by German Submarines in the 1930s. He also uses Krakatoa Measurements to show this provides the right amount of Pumice ! As his Final Insult to Credibility, he notes Plato reported the post-Atlantis Atlantic was Choked by Mud for centuries – – so, he says, Plato is REALLY based on EYEWITNESSES to the Pumice (pumice FLOATS, you know) ! PS :in Analog in the 1960’s a totally different crew calculated a PLASMA TOWER ~1200 miles high would would follow any Asteroid Seabed Hit. Just Glowing Stuff, but remember Plato talked of a Lightning Bolt thrown by Zeus as part of his Atlantic Atlantis’s destruction – – and thus is saying it wsa VISIBLE IN GREECE – – which – – fits the NUMBERS. So I have no doubts. But, if you want Preachers, Historians, Geologists, etc. to RUN not walk, in the opposite direction … just try to publish something on it. But it is Logical — the Numbers agree — So What ? I cannot even get the Simple alteration in the Small Comet Controversy (baloons have taken SAMPLEs so we know they are Identical to SeaWater. _MODERN_ Seawater. But Frank won’t admit they are coming FROM the Earth & not TO the Earth (thus Frank has them be the Source of the Oceans – – but if so, they should match ANCIENT Seawater before Erosion added stuff to it ). And his opponents won’t even admit they exist ! — even if they are detected on dozens of instruments & we even have SAMPLES ? ! ! PS I have also predicted all the Weird Stuff about the Lunar Water – – It is because it is SPORADIC – – water comets hit for 30,000 years after a Big One, then, 10 to 100 times as long until the next ones. It also compresses a percentage of Lunar Dust each time, thus there is not either NONE, OR 100s of feet. It’s BOTH – – the 100s of feet get compressed, Sporadically. Solving the “missing Lunar Dust Mystery”. I cannot get this Published, alas. So, sorry for the Long Post, but THAT is the WHOLE STORY of the Carolina Bays. Smiles – I JUST managed to throw the Carolina Bays into the comment just ahead of yours. Good to see someone else mentioned them. I will point out that the orientation is actually SE-NW, not NE-SW as you say – probably a typo. “Mossala fjärd” north of Houtskär” is critically linked to the description of catastrophic glaciation in the palaeological record, Statistical correlation of the age of fallen trees and standing stone rings in Scandinavia is possible because ring meteorites still preserved in former stave church churchyards prove that impacts have occurred historically, just as the Elder Edda Ice Moon hypothesis suggests, Since isotopic comparison of lunar mare materials proves some stony meteorites ordinated on the moon, we cannot discount the global warming effect of their atmospheric friction, the, capacity of some larger ones to impact the seabed and release ocean warming magma, as Plimer has so astutely pointed out, and above all, the criminal refusal of the IPCC to account for Co2 added to the atmosphere not by fossil fuel combustion as the Warmists allege, but by the oxidation of carbonaceous chondrites. Wonderful debate, lots of questions and potential new ideas. If my memory serves me correctly, it has been confirmed that guys, possibly Cro Magnons, from France replaced the Clovis culture in the North East USA. So who made that point seems to be correct. Next major issue relates to as big a storm as Climate gate, the CO2 Warmers versus the realists but in this case its gravity versus electricity in Astronomy. Puma Punku, big difference between dating human remains and dating the site. The site is much older and much work remains to be done there but Initial looks seem to indicate a possible mini Scablands event with rapid uplifting. Nearby is some of the worlds oldest terraforming done on a vast scale and extending into the Amazon Jungle. Seems then they farmed it and built Cities. Just adds more woes to the warmist “unprecedented” that they so love to instill fear with. Bit of a ramble but trying to eat my breakfast. The exploding of supernova Vela for about 11000 yers ago may have a large impact on earth. The Vela supernova was one of Firestone’s initial ideas about the Y-D event. Certina aspects of it led him more toward an impact event. If the Carolina Bays are tied to this event – which is not a certainty at all at this stage – then it is difficult to explain a connection between Vela and the formation and alignments of the Carolina Bays. They would seem to be two different events. I do NOT think Firestone’s thinking made this point. The loopy stuff being said by several new commenters, involving vaguely described theories of various catastrophic events, smells to me like an attack from 4chan or Anon. If you can overwhelm a legitimate forum with synthetic moonbattery, you can lower the value of that forum to its regular patrons. In other words, DON’T FEED THE TROLLS! It seems that an EXTEMELY curious particular in this story is the graphene/graphane itself. It is a very short Wiki entry on graphane, but a very long one on graphene. And graphene is a VERY interesting – AND essentially NEW – material, having been kind of “rediscovered” in 2004. Instead, graphene- and graphene/graphane-oxide aggregates [emphasis added] were found in all the specimens examined (including carbon spherules dated from before the YD to the present). Importantly, the researchers demonstrated that previous YD studies misidentified graphene/graphane-oxides as hexagonal diamond and likely misidentified graphene as cubic diamond. Now, after reading about graphene, that word “aggregate” jumped out like a lit arc lamp. You see, graphene basically is a one-atom-thick, 2-dimensional material. So what is this about “aggregates”? Because it was found in the “black mat” (which seemingly NEEDS to be in quotes, btw), I went searching for how graphene is formed in nature. Simple enough, yes? Is it common in meteoric material? Is it formed in impacts? Is it common in graphite? show that the material reported as diamond is instead forms of carbon related to commonplace graphite, the material used for pencils. You see, THAT is supposed to be them laughing down their nosesthe Y-D people – RUBBING their noses in it, even – who evidently can’t even tell nano-diamonds from common everyday graphite. the presence of hexagonal diamond in YD boundary sediments represented the strongest evidence suggesting shock processing,” Daulton, who is also a member of WUSTL’s Center for Materials Innovation, says. Well in a LONG Wiki entry, guess what? They don’t mention graphene being made naturally at ALL. Does that strike any of you as odd? It seems that graphene is sort of the current Wunderkind of materials science. As of 2009, graphene appears to be one of the strongest materials ever tested. Measurements have shown that graphene has a breaking strength 200 times greater than steel. Since 2004, labs have been working on ways of making graphene, which is NOT easy, yet there have been several developments. One thing they ca NOT do is make “large” sheets of it. . . So we have this REALLY odd material that has only been known really since 2004. Firestone was getting his book published about that time. No wonder if his labs didn’t recognize it. The work was being done in Manchester, England, and not many people in the world really knew about it. One MIGHT forgive them for mistaking some new material – especially one in a form not known even now, if I read Wiki correctly. Nano-diamonds are not 2-D, but the material in the “black mat” is an “aggregate,” whereas graphene is only 1 atom thick 2-D material. Now I am getting a disconnect here. The article is scathing in its laughter at the “Y-D team” for having mistaken graphene/graphane for nano-diamonds – EVEN THOUGH GRAPHENE WAS A NEW MATERIAL, GRAPHENE IS 2-D, AND THE MATERIAL IN THE “BLACK MAT” WAS AN AGGREGATE. GRAPHENE DOES NOT COME AS AN AGGREGATE. On the surface, it seems the researchers are anymore correct than the Y-D impact scientists. If it is an aggregate, it cannot be graphene. If it is graphene OR Graphane it cannot be an aggregate. In the very long article Wiki does not ever say how graphene is made in nature. Which I find most interesting. I am still looking elsewhere. . .
1) Murray Springs: we reported NDs in sediment. Insterad they tested charcoal, in which we have never reported finding NDs. 2) Arlington: we reported finding NDs in 10-15 CS. Instead, they tested one to several of a mix of CS, charcoal, and a glassy carbon. If these people are claiming “graphene” now the “skeptic” lab coat can be worn on the other side of the aisle. Graphene, a 2-D material with a max thickness of 10 layers (atoms) – how do they justify calling it an “aggregate”? Graphene – has it ever been SEEN in nature? I am wondering if they didn’t screw up. Quote ‘In other words, DON’T FEED THE TROLLS! You take a real interest in the world around you, enter a discussion about a possibly world changing event with an alternative but still valid vies and you get called a troll. Dont forget that is exactly the same track that warmers take, all dissenters are deniers, skeptics etc. In view of the Climategate E-mails and subsequent exposures of many deceptions, dont you think that it is right that all science should be up for investigation. In my posts above I indicated by my comments clearly divergent evidence from the mainstream. It needs debate. GL, way back at 8:02 PM on the day before yesterday you claimed that the destruction of Puma Punku was at about the same time as the Younger Dryas. My definitive source, heh, Wikipedia, claims that Puma Punku thrived from about 400 AD to 1000 AD, when it was apparently abandoned rather than destroyed. We are not talking about the same Puma Punku, are we? So tell me about yours, the non-human one. “don’t you think it is right that all science is up for investigation”? All science, always, is subject to skeptical inquiry, but the rest of science has not been subjected to the same concatenation of fame, power, and money that climate science has encountered. It is clear that the uses to which climate science can be put by the politicians have perverted it beyond the realm of science. I do not think the rest of science has been subjected to such torquing, certainly not to the degree to which climate science has been wrenched. But you have a bit of a point. Years ago I decided that the main social function ultimately of this climate scandal may be to help immunize us against the next attack of an ‘Extraordinary Popular Delusion, and Madness of the Crowd’ and we may be just a little less likely to stampede over a cliff, all in the name of Holy Science. Kim, as you know, wiki is not the best source although it can be useful. There are a lot of studies on the site, the best I feel are Bolivian. You can google and find a lot. But you have to weigh it. I found out a lot of interesting stuff, in particular re agriculture but that is not relevant here. More to the topic, look at the date of the layer, what happened then around the world. How did the layer form. A tipping point (to use the accepted jargon) for me was the discovery that Niagara falls began at that time. Its a case of join dots, see where it lead not what Wiki says. All else being equal, I would love to find a CO2 emitting “warmer” that can replicate Puma Punku. Well, I indicated my post was theory, albeit mine. And it still produces the best possible conclusion with the evidence to date. My initial research is linked, and backed up by Harvard. So much for my ‘trolling’? Well, GL, at least I now understand the basis for your claim that the destruction of Puma Punku was contemporaneous with the Younger Dryas, but wouldn’t all that upheaval have destroyed the astronomical alignment which seems to me the best evidence for an earlier origin of the monuments there? The YD is a cluster of cold events the similar to the LIA, also known as a Heinrich event. These ideas seem like a good “null hypothesis” — the YD was simply another Heinrich event. Such events occur regularly during glacial periods when climate “sensitivity” is high. When most glaciers disappear during interglacials, the sensitivity is low and the Heinrich events are greatly muted. The YD occurred because the interglacial wasn’t well-enough established yet (and glacial sheets had not yet melted enough) to mute the event. However, the real cause of the YD is still up in the air — it will take quite some time to gather enough evidence to say one way or another. Interesting. If I recall correctly, from 45 years ago, Velokofsky wrote of the indigenous people of the New Mexico/Arizona area having a legend of a fireball in the NE that destroyed a lot of life. I know Velokofsky is not considered well for his analysis of myths, but myths have an origin in something. The story of humans leaving their idyllic relationship with nature, henceforth children were to be born in pain, a hint at larger cranial capacity at the time of leaving that idyllic state? Kim, possibly yes or no, depends upon the structure and shape of the alignments. 40 years research is a lot and no doubt contains a lot of detail. remember that is just one report. I have some technical issues. The horizon with the watermark slopes, but the temple floor seems level. Thats just one example. So you need to read a lot of studies from various sources to get a better picture, not necessarily more accurate. Without a shadow of a doubt, this was a massive climatic and environmental event. The mystery layer adds spice to the mix. The link has links that describe in detail the extinction and sources of remains around the world. It also pictures carvings of life extent at that time but extinct in the promoted age. All again makes a mockery of the warmists claims to unprecedented this or that. We must at all costs fight any dilution or censorship of this site’s authentic and autochtonous discussions of cosmic ray induced climate modulation. alternative theories of solar nucleosynthesis and coupling of the weather here and on Mars with synthetic moonbattery of any sort, lest it invite fatally flawed fetal bat tissue experiments and an abortive increase in Warmism in Alaska. What better proof could anyone want of continuing cold temperatures in New England than recent reports of the decimation of its furry flyer population by fungal white-nose disease- hardly a tropical affliction. Actually a lot more than just the stratosphere would be filled with reflective water vapor/ice crystals. Basically the entire high altitude atmosphere from the point of the comet material(s) first encounters with friction, gradually on down. Its a fit. The loopy stuff being said by several new commenters… If you can overwhelm a legitimate forum with synthetic moonbattery, you can lower the value of that forum to its regular patrons. There are no trolls here. Think of what a troll represents: incredibly slow and stupid, aggressive, knocking people down. What you see here is right-brain thinkers breaking out along a “fault” that is already opening up uncomfortably in the world of science – the hints of catastrophism at the YDB that not only don’t fit the current geological paradigm, they threaten not to fit the current paradigms of physics. That’s a really big threat, just like climate skepticism is to AGW’ers. So there is a low level of style, grammatical correctness, and comprehensibility. But the hints suggest that behind the poorly-expressed ideas is a reasonable degree of scientific savvy. Creative thinking is likely to be incorrect in details, even when it’s right in its central principle. If creative thinking is forbidden here because it might be incorrect , or because its upholders are poor writers, God help us. Look at those Carolina Bays pictures. The sheer perfection of ellipticity, and the flatness, simply do not compute with conventional impact from rocks, to me. Then there is the prevalence of radioactivity; high levels of iridium etc. in the YDB. There are an awful lot of things that don’t fit, that left-brain scientists would like to quietly disappear into a “Censored” file. I’ve seen far too much Mannian censoring to trust orthodoxy. So I see a warning flag with this paper – “no nanodiamonds” – none anywhere? no, it’s graphene/graphane – but hey, these materials are only newly-discovered, and extraordinary in themselves “Many other lines of evidence — including: fullerenes, extraterrestrial forms of helium, purported spikes in radioactivity and iridium, and claims of unique spikes in magnetic meteorite particles — had already been discredited” – h’mmmm, where have I heard language like this before? There is definitely something up with this YDB. My BS detector says so. Therefore all clues might help, even misspelt clues. I respect Scientific Method – but the real thing is, one has to practice it holistically – with one’s whole being, at all levels of outer work and inner feelings and reactions. One has to be open to the possibility of being wrong, be ok with accepting respectful criticism, be able to bat away any real rudeness, have a BS detector for when orthodoxy is likely to be circling the waggons and not doing science, and TEST that BS detector for evidence that it was right (or wrong). So I will read PNAS (Richard Firestone 2007), The Cycle of Cosmic Catastrophe (Firestone et al 2006), and Magnetic Reversals (Robert Felix 2009) to stress-test my BS detectors and generally study something really interesting, sparked by this thread. I couldn’t agree more Lucy. Something definitely happened at the beginning of the YD that resulted in major cooling event (s?) that lasted another 1,000 years just as we were pulling out of a major ice age. Whatever caused that reversal has never been fully or adequately explained and we would be remiss not to look at all possibilities until we are able to do just that. Chris, your concern for the New England Bats is heartwarming but their affliction is very minor indeed compared to the scope and range of extinctions at the YD event. Lucy, thank you for noting my disrespect for the English Language, its true. Perhaps its a part of the testing that I am subject to. Thank you for your acceptance of my faults, it is appreciated. I was well and truly “Manned” with my link above, I was looking for temperature, thought I had temperature but instead now discover its a proxy. But, what a proxy, would love to see the current state of that. Grey, I hope Tony will go to bat for his site’s concerns at this week’s International Congress of Palaeooceanography in San Diego. It is a continuing scandal that the many IPCC authors attending have suppressed all mention of the peer reviewed Cycle of Cosmic Catastrophe that Linda has pointed out. Their squalid refusal to acknowledge how the evolution of cancer tumor immunity in shark cartilage reflects their adoption to cosmic ray bursts militates for replacing the teaching of Darwinist theories with sound science in home school curricula, before other so-called ‘educational’ television stations (ever notice how few employ meteorologists !] are attacked by Malthusian warmistas or have their signal to noise ratio degraded by Telluric Current induced thermionic heating from blacktop parking lots. Dear Leroy – not to worry, Dalton is a competent scientist and did what he could do with the materials given to him. The problem lies with Scott and Pinter. 1. They did not collect from the YDB layer at the Arlington site that was used in the two Kennett et al papers, but from layers that contained “carbonaceous particles”, mostly charcoal – there are no diamonds in charcoal and it is not clear that they even sampled the YDB. 2. They did not collect or at least process the YDB sediment at Murray Springs, which contains most of the nanodiamonds in the YDB as loose nanodiamonds – probably too much work because the work is labor intensive – need to separate kilos of material. The diamonds average about 50 to 100 ppb and you need a lot of diamonds, processed by the correct separation protocol. 3. Yes, we saw graphene, graphane and chaoite, but these are not diamonds. 4. They analyzed microcharcoal and glassy carbon for diamonds and found none, neither did we! These “carbon particles” were made outside the constrains for diamond production and survival. 5. Two reviewers for the Kennett papers are world class shock and diamond experts – they had no problem. 6. One independent stratigrapher who read the Daulton paper was astonished at the “complete ineptness of field protocol and sample characterization”. Of course, you and others can judge for yourselves. 7. The Greenland paper (Glaciology) will appear in September and there are sufficient diamond data in this paper (STEM, HRTEM, RAMAN, EELS, etc.) to prove once and for all that diamonds do, indeed, occur in the YDB. And then September issue of Science has this headline about the Daulton paper: Mammoth-Killer Impact Flunks Out After a new study failed to find nanodiamonds, impact experts are flatly rejecting outsiders’ claims that an impact 12,900 years ago devastated the megafauna. Don’t be silly. It’s an infant science. There ain’t no such animal as an impact expert folks. And if there is, Daulton, Pinter, and Scott, certainly don’t qualify. And just what is the nature of the three ‘insiders’ knowledge, that was withheld in the education of the dozens of ‘outsiders’? And who decides who’s condemned to ‘outsider’ hell along with all of us poor unfortunates? The popular press? It’s not the peer review system this time. The pro-impact “outsiders” studying the YD impact layer are out publishing the “insiders” ten to one. It’s not research funding either. The outsiders aren’t exactly rolling in the money, but they aren’t being denied funding either. They are all receiving the full support of their respective institutions. For once it is the data that’s driving the research, regardless the negative propaganda of the popular press. Three obscure scientists on the inside. (of what?) using blatantly flawed protocols, couldn’t collect, and prepare, stratigraphic specimens with sufficient skill to detect nano-diamonds in a thin layer of strata, that dozens of scientists before them on the outside haven’t had a problem with. Those ‘insiders’ did not look in the same places in the strata as the original researchers. (The NDs are in a well described, but thin layer underneath the ‘Black Mat’, at the top of the extinction layer) They didn’t test the same materials. Nor did they duplicate the sample collection, and preparation, protocols of the works they were supposed to be challenging. Rule #1 Thou shalt duplicate the experiment. Since they haven’t, their shamefully incompetent work didn’t debunk, or disprove anything. The article in Science was a day late. (literally) The new paper in the September issue of Journal of Glaciology, (from those darned outsiders again.) reporting a discreet layer of NDs in a layer of ice in the Greenland Ice Sheet corresponding to the YDB blindsided them. This time the outsiders anticipated another cheap shot from those pesky insiders though. So they provided enough data to settle the question of NDs in the Younger Dryas boundary layer once and for all. But the nanodiamonds aren’t the only data that needs to be tested. Suppose everything R.B. Firestone et al proposed in their 2007 paper Evidence for an extraterrestrial impact 12,900 years ago that contributed to the megafaunal extinctions and the Younger Dryas cooling regarding the impact of a giant fragmented comet is true. And suppose that Bill Napier’s proposal in his paper titled Paleolithic extinctions and the Taurid Complex, that the giant comet involved was non other than the Taurid progenitor is also correct. Firestone, and friends cited Toon et al when they estimated that the devastation may have been equivalent to as much as 10^9 megatons TNT. And temps could have gone as high as 10^7 degrees C. Ten million degrees does seem a bit extreme, doesn’t it? I asked Bill Napier about that temperature. He pointed out that even if the object hit the upper atmosphere at 30 km/sec, and 100% of it’s difficult to get much more than 10^5 degrees C.
But that’s still hot enough to melt stone, and make it flow like water for a moment. Considering the distribution of the nanodiamonds found in the YD boundary layer, that hyper thermal impact storm must have blanketed half the continent. The Taurid progenitor has been estimated by Bill Napier at something like 10^15 gm. And 50 to 100 km in diameter. That’s 1.1 billion tons. And as you are probably aware, a significant amount of that original mass is missing from the Taurid Complex. When we bring the recent work on the Younger Dryas boundary layer together with the astronomical model provided by Dr Napier, the YD impact hypothesis becomes a fully fledged theory. If you can describe a beast, you can predict it’s foot prints. Professor Napier’s model describes something that was completely fragmented, and tidal forces had probably stretched the debris into a very long stream of fragments and particles. The event would have lasted a little more than an hour as the Earth’s orbit took it through that debris field. Extraordinary theories require extraordinary proofs. In such an event, only the first fragments to fall would have fallen into cold atmosphere. The rest would have fallen into already superheated impact plasma, and just cranked up the heat, and pressure. The resulting thermal blast winds should have been able to toss whole mountain ranges aside like clumps of flour on a bakers table. And melt them like butter under a high pressure blowtorch. The NDs weren’t the only blast effected materials of that event. Only the hardest to detect. The ground didn’t get smashed, and broken by solid bolides. It was flash melted and blown away by supersonic gusts of thermal impact plasma. Where the extraordinary proof comes into it, is that we need to be able to identify hundreds of thousands of cubic miles of flash melted stone, and other blast effected materials. The impact storms of the Taurid progenitor were hotter, and more geologically violent, than anyone has ever imagined in their most frightening nightmares of devastation. The planetary scarring of the event bares no resemblance to anything in current impact theory. Or NASA’s current NEO threat assessments. And our extraordinary proof is the in fact that all of hundreds of thousands of cubic miles of blast effected materials of the primary impact zone are in context, in pristine condition. They are all present, and accounted for. And they aren’t ballistic impact craters. Here’s links to those two papers. There are some major problems with the numbers you give. A 100km diameter object has a mass ~1e15 tonnes, not 1e15 grammes. At an impact velocity of 30km/s the explosive energy is 100tonneTNT/tonne. On the other hand, 1e15 grammes (equivalent to a 1km impactor) would produce only a 1e5 MT blast, which would devastate only a small fraction of the continent. This is too small to cause sufficient ecological damage, unless subdivided into many well-distributed objects. Even then, it would be a lot tamer than your apocalyptic description would suggest. But where is the refereed literature published where the specific density, or weight of any asteroid, or comet, has ever been measured? The specific weight given by professor Napier is 10^15 grams. which works out to well over 1.1 billion tons. No one has ever said the Taurid Progenitor hit all at once. The 1.1 billion tons is the estimated size of the object when it was first injected into the inner solar system into a short period elliptical orbit. It began to breakup immediately. The Taurid Complex is the remaining debris. And the Diameter given for the original size of the TP was an estimate, not a firm figure. It is described as between 50 km, and 100 km, before it began to breakup in the inner solar system. It had been breaking up for millennia before the timing of the crossing orbits brought the highest concentration of fragments, and the Earth, together at one of the two the crossing points. That first, and worst, impact shower from the Taurids would have lasted a little over an hour. In an almost continuous rain of airburst impacts equivalent to well over 10,000 Tunguska’s; not a single bolide impact. The scary part, is that when you study the Taurid Complex, you realize two significant points. 1.) There is an awful lot of mass missing from the system. 2.) There is also an awful lot of mass remaining in the Taurid Complex. And all of it is in an Earth crossing orbit. The Taurids aren’t through with us. No, that typo did not cause me any misunderstanding. That is not where the problems lie. You have a contradiction between the supposed diameter of the original object and its mass – out by a factor of a million! A 100km object has a mass ~1e15 tonnes NOT grammes. Do the sums. 4pi.r^3.ro/3. Say ~500,000 cubic km x 2 tonnes/m^3. There is also an inconsistency in the supposed explosive energy of the impact event and its effects. First of all I keep writing 10 e15 gm and you keep reading 1 e15. The proposition that an exceptionally large comet has been undergoing disintegration in the inner planetary system goes back over 40 years (Whipple 1967), and the evidence for the hypothesis has accumulated to the point where it now seems compelling. Radio and visual meteor data show that the zodiacal cloud is dominated by a broad stream of largely cometary material which incorporates an ancient, dispersed system of related meteor streams. Embedded within this system are significant numbers of large NEOs, including Comet Encke. Replenishment of the zodiacal cloud is sporadic, with the current cloud being substantially overmassive in relation to current sources. The system is most easily understood as due to the injection and continuing disintegration of a comet 50–100 km in diameter. The fragmentation of comets is now recognized as a major route of their disintegration, and this is consistent with the numerous sub-streams and comoving asteroids observed within the Taurid Complex. The probable epoch of injection of this large comet, ~20–30 kyr ago, comfortably straddles the 12.9 kyr date of the Younger Dryas Boundary. The hypothesis that terrestrial catastrophes may happen on timescales ~0.1–1 Myr, due to the Earth running through swarms of debris from disintegrating large comets, is likewise not new (Clube & Napier 1984). However the accumulation of observations has allowed us to build an astronomical model, closely based on the contemporary environment, which can plausibly yield the postulated YDB catastrophe. The interception of 10e15 gm of material during the course of the disintegration is shown here to have been a reasonably probable event, capable of yielding destruction on a continental scale. No, you wrote 10^15, which is 1e15. In your cut and paste you have now changed what Napier wrote from ~10^15gm to 10e15gm, not only making a further error of a factor of ten, but also losing the important order of magnitude sign. It is easy to make such slips, but defending them smacks of innumeracy. I don’t believe you understand Napier’s paper. The ~1e15gm mentioned was not the mass of the cometary progenitor, but a hypothetical amount of material that, impacting as a stream of suitably sized pieces, could cause the amount of damage the scenario required. That progenitor, if of 100km diameter, would have a mass ranging from ~1e20gm (for a very low density fluffy ammonia and water snowball) to ~1e21gm (for a rock and ice aggregate), which is 1e5 to 1e6 times more massive.